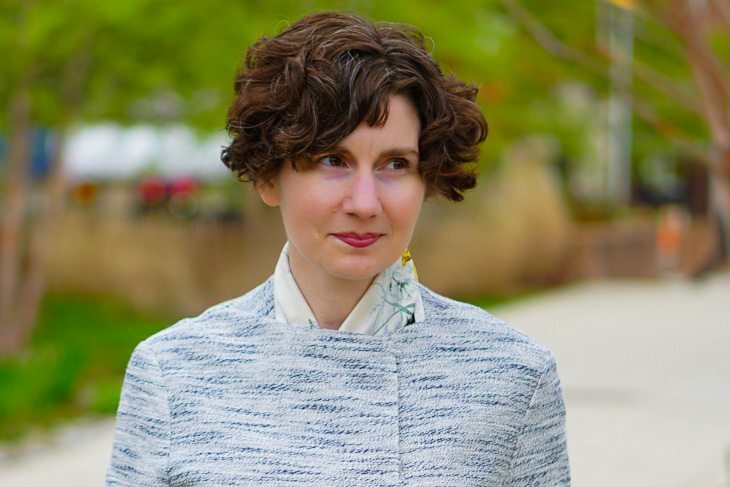 I have written previously about the many virtues of large scarves (in what I believe to be one of my funniest posts), but I am equally enthusiastic about small scarves measuring 18-24″ square. We can all agree that a scarf — the right scarf — adds a certain chic to the day. Why is this exactly? As we like to do on The Directrice, let’s break it down. First, and most simply, a scarf adds an elegant texture — supple silk — to an outfit. 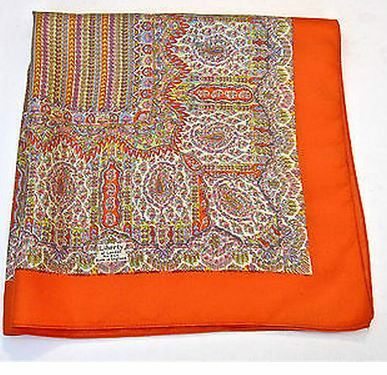 Second, a patterned scarf brings graphic complexity. Third, a scarf creates movement — a certain dynamism — in your outfit because it is literally moving around during the day. Fourth, a scarf adds a gesture; there is something very elegant about tying or untying a scarf. Finalmont, a silk scarf wrapped around one’s neck adds a little warmth and protection from scratchy wool in colder months. Create the look of a collared blouse, without the bulk of a blouse. I have a few white and black-and-white-patterned scarves for this purpose. Add a jot of color to an otherwise dark or monochromatic ensemble. Add a vintage or whimsical touch to a directional look. Actualize a maximalist impulse to layer pattern upon pattern. 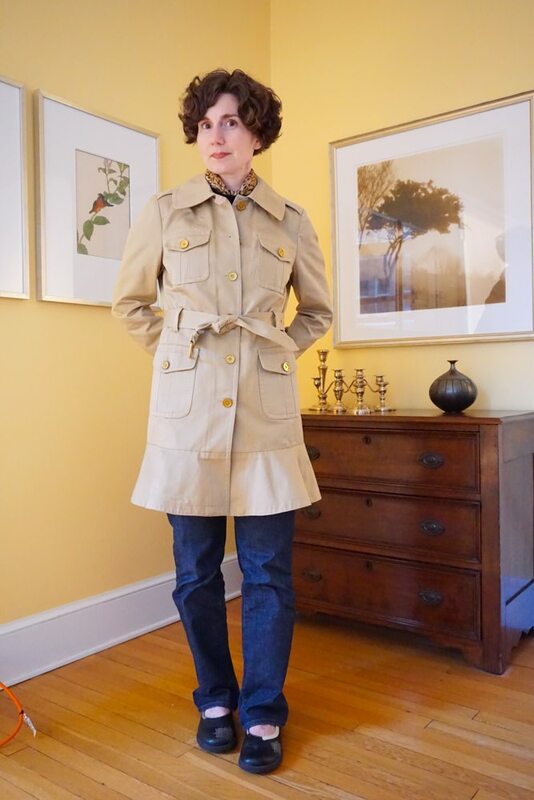 Add polish to outerwear; a coordinating scarf tucked inside your jacket or coat collar is always an elegant touch. While large scarves can be tied in numerous ways — Hermes published a printed guide to the tying of scarves back in the 80s (check eBay) and now has an app! — smaller scarves can only be wrapped a few ways because, um, there’s only so much material to work with. 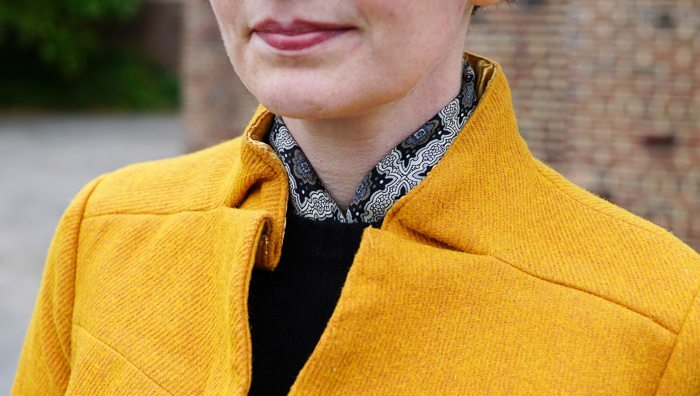 I generally fold mine in half on the diagonal, tie the ends in a fat square knot and tuck the whole thing into the neckline of my sweater or top. 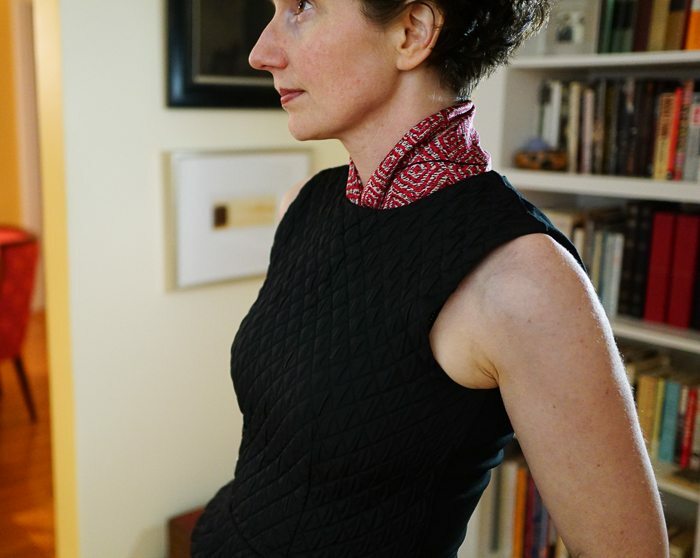 Sometimes, when I don’t want the bulk of a knot, I will fold the scarf to create an oblong length (4 inches wide) and then simply cross one end over the other and tuck the whole thing into my neckline. If the scarf is closer to a 30″ square, I will tie a square knot in front and then tie the loose ends in a second knot at the back of my neck. Can you visualize this, or do I need to add video? DirectriceTV . . . think of the possibilities. P.S. Did you think I had deserted you? I’ve been in an unusually busy period at work and had technical difficulties with the site this week. The technical difficulties continue, so postings may be irregular next week. We’ll see! Your scarf tying method of tying a knot in the center and then tying it at the back of your neck is a good one. I have lots of small scarves, most from a few years ago when they were more in vogue. ( but I don’t think any scarf is ever out of style. ) I love scarves and wear one almost every day. The only ones I can’t figure out how to use today are the floppy bow ties of the eighties…Directrice, you’re too young to remember! Are you familiar with Mai Tai’s Picture Book? So many good ideas! Sharla, I’m with you on this one. Even when I tie them, they migrate around. Clearly we need video. I’m fairly new to your site, having followed a link from Sally at Already Pretty, and am really enjoying jumping around in the archives. I admire your style, but your written voice would have kept me here regardless. I think I have pictured your scarf tying description correctly, however I cannot pass up the opportunity to request said video, so please do post one when you are able. 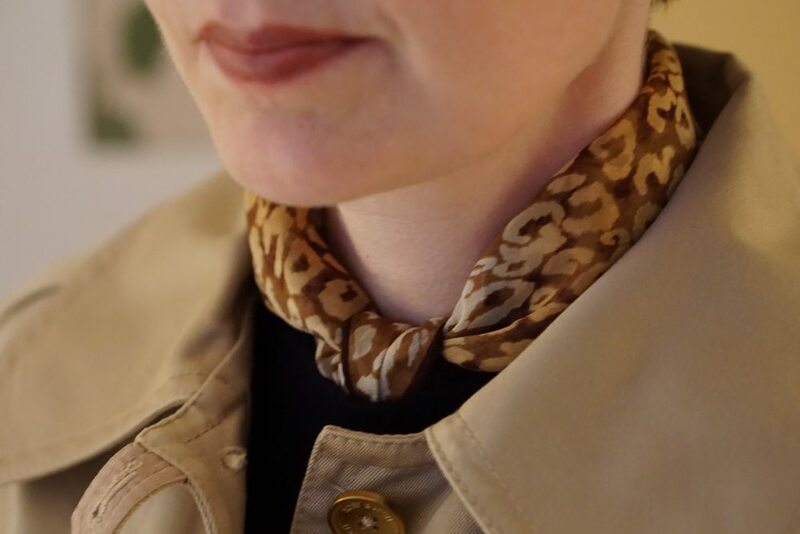 As one of my favourite accessories, I’m always interested in new ways to tie scarves but find a new method easier to follow when I have seen how well someone styles them on a regular basis. Welcome, Cathi! I am so glad you found your way to the blog and are enjoying it. A video will be a Thanksgiving weekend project. Excellent exposition on the small scarf. It’s like the detachable collars you see the manservant spot cleaning on Dowtown Abbey. I am so glad you wrote this post, thank you! And I am also glad to find that a video is in the works; I am curious and eager to see exactly how you bring those small scarves to heel. I notice that your small-scarf outfits most often involve high crewneck tops — actually I think you wear that neckline quite a bit in general. As it happens those close-fitting crewnecks look quite dire on me (!) so I suspect that I may have to adapt your methods a bit to get them to work with scoopneck and v-neck tops. However, I am quite inspired to play around and do so! Thanks again for covering this topic.